Welcome to the online home of the Wake Forest Rowing Team! 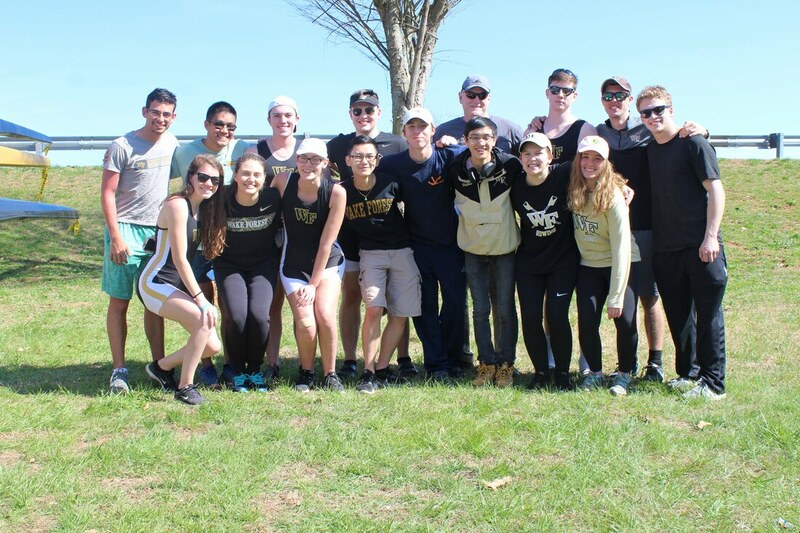 We are an entirely student-run organization that brings the hard work and excitement of collegiate rowing to the students of Wake Forest University! Please take a look around and consider supporting the team by making a donation, coming to a regatta, or for students, joining our team. The team had a great day of many races at Oak Hollow Lake for the 1st annual High Point Scrimmage. For more information, take a gander at the Schedule & Results page of our website. The team tipped off our regatta #szn with the annual visit to compete at the John Hunter Regatta in Gainesville, Georgia. The 1996 Summer Atlanta Olympics held events at this venue, which excited everyone. Thank you to all the friends, parents and siblings that came out to support us. Refer to the Schedule & Results for details on our performance. The team kicked off our 2K season with a day trip to Gastonia, North Carolina to compete at the Hammerfest Erg Sprints. Many of our rowers achieved their personal best times! Visit our Schedule & Results for more information. Donating to Wake Forest Rowing Club has never been so easy! Check out our new and improved donation platform here. Congratulations to our HOTS medalists! VM1x [Silver] and Mixed N2x [Bronze]! The weekend of April 20-21 the team competed in the SIRA Championship Regatta in Oak Ridge, TN. In two days we had five boats compete in a total of 13 races. ​​A huge congrats to everyone on the team for a great season! We had six total boats compete: VM4+, VW4+, NW2x (MW2x), NW4+, NM4+, and a mixed 8+. Huge congrats to the VM4+, NW4+, and NM4+ as they all made finals; and a special shoutout to the NM4+ for finishing SECOND in finals! Our mixed 8+ of varsity/novice members continued tradition and placed SECOND! Overall a great showing from everyone with plenty of motivation to push on to SIRAs in two weeks. We had four boats compete, VM8+, NW4+, VM4+, and VW4+. A huge congrats to the women's Novice 4+ for placing FIRST in their race with a time of 8:26:76 and the men's varsity 8+ for making Petite Finals. A strong showing from everyone and a great weekend spent in Georgia! Help send us to SIRAs! 1) Join us at Tijuana Flat Tex-Mex Wednesday April 11, 5-9 pm! Please sign up to eat or simply have a nice dinner out and mention Wake Forest Rowing Club to help support us in our endeavors. 2) Carry on with your online shopping habits and support WFRC while doing it. Visit our Campus Causes page and shop hundreds of name brands*. A portion of each purchase goes towards our club. Strong showing from the whole team at Erg Sprints 2018! With PRs all around we had two novices clinch a medal in their sprints, with stellar performances from varsity and novices alike. A special thanks to High Point Rowing Club for hosting.